Your guide to Utah's best Motorcycle Trails. Everything you need to plan your next dirt bike or ATV motorized trail riding adventure including maps, GPS, video, and trail information as well as the best hikes near your riding areas! What a View On a Perfect Evening!! 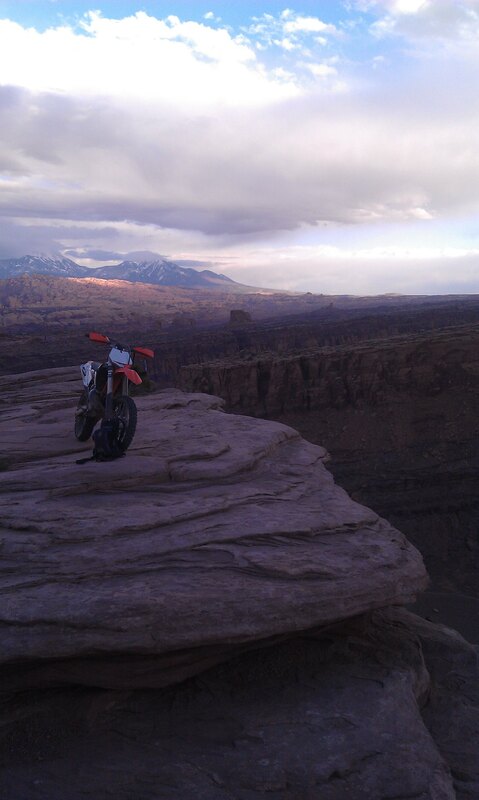 They testified to us that dirt bikes were the way to travel this trail. At the time I thought, yea it may be the easiest, but not sure if it's the most fun and/or challenging. A motor definitely makes things easier, but it surely does not remove all the challenges. Places where you could lift a mountain bike have to be ridden or worked up off the bike which is no easy task either. Having just 2 wheels as opposed to 4 make route choosing easier however. This is a short trail on a dirt bike and can be done very quickly especially compared to the other 2 methods mentioned. I did the trail twice in an evening ride going out to the lookout, then back to the road to repeat the trail. This trail is difficult with many intermediate areas in between the more difficult obstacles. A few difficult sections without a real bypass increase the difficulty level. I found going back through the "cliffanger" section to be the most difficult so pay attention when going down this spot to make sure you will want to come back up it. or click for Directions To Trail Head from your location then follow the gps markers as detailed below.